Is there anything better than watching playoff hockey overtime between two teams that are not your own? When your favorite team goes into extra sessions, it can be an excruciating exercise, a study in helpless hand-flapping and nonstop pacing and burying your face into the couch cushions like you’re watching a particularly gruesome torture scene on The Americans or Game of Thrones. If your team loses: total nihilistic emptiness, a roundhouse kick to the gut. If your team wins, it’s more like childbirth (or so I’ve heard) or going to the gym (or so I’ve heard): You walk away high on love and endorphins; you convince yourself the grueling process was well worth it, that it was really not all that bad. But when two third-party franchises are the ones skating up and down the ice without commercial breaks, trading breakaway chances, their fortunes hinging on one idiotic penalty or one wacko bounce of the puck — well, you can root for the game to never end, for it to carry on and on and on, deep into the darkness of the night. Twice the Predators had led in regulation — on a rapid-release rocket of a point shot from Ryan Ellis that Colin Wilson tipped in, and on a real-deal James Neal steal — and twice the Blackhawks had evened the score. First, Antoine Vermette, who was a healthy scratch for Chicago in the Blackhawks’ first two playoff games, “swung at a pitch from Michal Rozsival,” as a Tribune writer put it, just over a minute after Ellis’s goal. Later, midway through the third period, Marian Hossa set up Brandon Saad with a back pass in the slot, and the game was tied 2-2, a score that would remain throughout the rest of regulation, two full overtime periods, and about 60 seconds of a third. You never know what will take place in these extra innings: At one point, Nashville defenseman Seth Jones and Chicago forward Patrick Kane had a fun role reversal, with Jones streaking into his offensive zone with the puck and Kane successfully back checking to negate the opportunity. (I assume that while this American-on-American interaction took place, somewhere a bald eagle laid a golden egg.) Later, Predators goalie Pekka Rinne — who stopped 45 shots on goal, while Chicago backup Scott Darling saved 50 — lost the puck in his equipment for so long that the announcers began to wonder, as Rinne danced the hokey-pokey, if he’d wind up disrobing on the ice. When the Hawks finally won the game, a minute into triple OT, it wasn’t off Kane’s shot from between the circles, but rather a one-timer by defenseman Brent Seabrook from the blue line, the 100th shot of the game. With Bryan Bickell screening Rinne, the puck saw its way through the tangle of humanity in front of the goal and wound up in the back of the net. The only fans more disappointed than Nashville supporters were the ones who had secretly been hoping the game would never end. It’s hard to believe it was seven years ago that the Capitals debuted their “Young Guns” promotional poster featuring fledgling pups Backstrom, Alex Ovechkin, Alexander Semin, and Mike Green. As the years went by and Semin left the team, Ovechkin struggled, and the Caps never reached their collective potential, the nickname became a bit of a punch line. Ovechkin opened scoring in last night’s game after Backstrom won a faceoff and sent the puck back to defenseman John Carlson. Carlson took a wrist shot from the point, and Ovechkin, his stick trailing behind his body as he skated across the slot, redirected the puck past Jaroslav Halak and into the Islanders’ net, giving the Capitals a 1-0 lead for the first time in the series. With a dozen seconds to play in the first period, the Islanders responded when Casey Cizikas buried a rebound past goaltender Braden Holtby from the left side. Midway through the first overtime period, John Tavares was shadowing Nick Backstrom along the low boards when the Islanders captain’s stick broke in his hands, leaving Backstrom with that most dangerous of playoff combinations — “time and space.” He turned around, whipped the puck toward the net, and gave the Capitals the win. It was, according to Islanders coach Jack Capuano, the third time Washington had scored thanks to a New York broken stick this series. 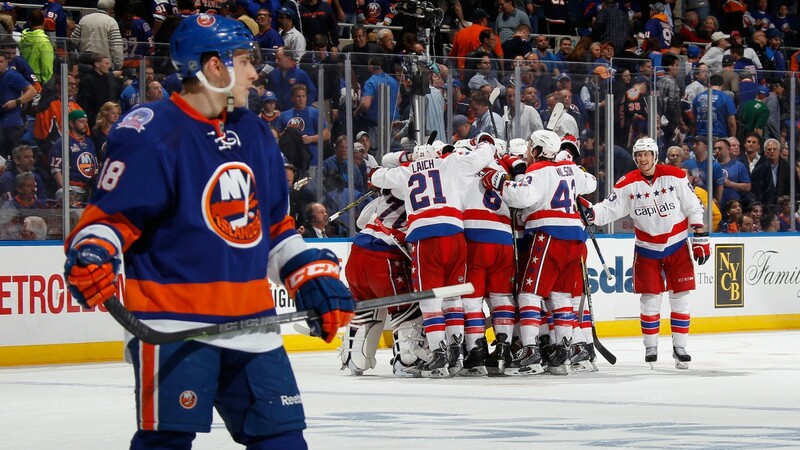 It was also the third time Backstrom had netted a goal against the Islanders in as many games. “Sometimes you wonder if the rest of us are playing checkers and he’s playing chess, the way he thinks the game and sees things,” said Backstrom’s teammate Matt Niskanen after the game. As the Capitals celebrated on the Nassau Coliseum ice, a disgruntled fan tossed a beer that glanced off Brooks Orpik’s shoulder. (Hey, it’s better than a skate blade!) It was an understandable, if juvenile, reaction: There’s really nothing worse than seeing your team lose in overtime that way. I was disappointed, too, a little bit, having hoped that the game would continue on for always. When it comes to playoff hockey, it’s hard to want the party to ever end.